Honest, diligent and brave Police Inspector Karan Saxena while carrying out his investigations against gangster and smuggler Bhujang is mysteriously framed and transfer to a remote area called Madhavpur. While residing there Karan sets to put things right and gets into confrontations with a bandit, Jai Singh who is good at heart and always ready to fight for the oppressed because his own dad, a brave Martyr has been killed by Bhujang, he too join with Karan to wreak vengeance against Bhujang. Ravi the son of the Mumbai Police Commissioner, Mathur joins Bhujang gang secretly wanting to get his own revenge from Bhujang. These three men Ravi, Karan and Jai manage to gather evidence against Bhujang and his gang and sets out on a dangerous road of crime, without the laws help in order to liberate the country from Bhujang / Bhairav Singh and his gang.Honest, diligent and brave Police Inspector Karan Saxena while carrying out his investigations against gangster and smuggler Bhujang is mysteriously framed and transfer to a remote area called Madhavpur. While residing there Karan sets to put things right and gets into confrontations with a bandit, Jai Singh who is good at heart and always ready to fight for the oppressed because his own dad, a brave Martyr has been killed by Bhujang, he too join with Karan to wreak vengeance against Bhujang. Ravi the son of the Mumbai Police Commissioner, Mathur joins Bhujang gang secretly wanting to get his own revenge from Bhujang. 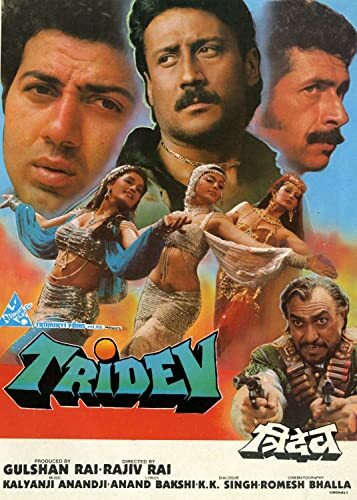 These three men Ravi, Karan and Jai manage to gather evidence against Bhujang and his gang and sets out on a dangerous road of crime, without the laws help in order to liberate the country from Bhujang / Bhairav Singh and his gang.